CIVIDEC Instrumentation GmbH was founded in 2009 by Dr Erich Griesmayer. The internationally operating company has its headquarters in the heart of Vienna, Austria. CIVIDEC specializes in the development and production of radiation diagnostic systems, which are based on synthetic chemical vapour deposition (CVD) diamond detectors, analogue electronics and digital real-time data processing units. 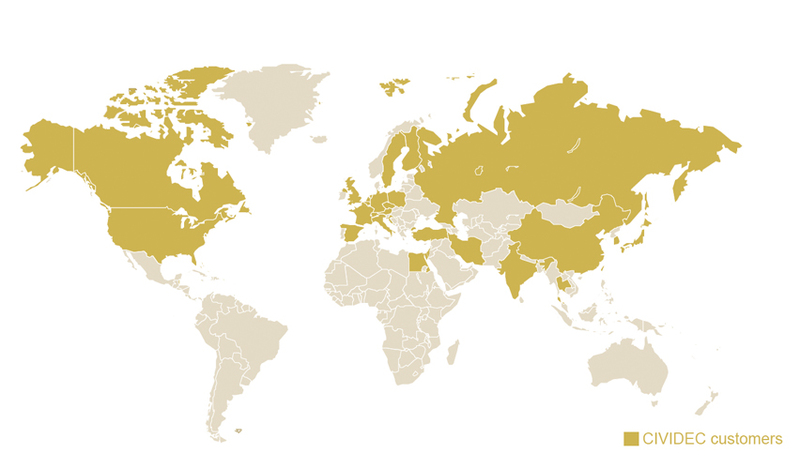 Our technology is used in 24 nations worldwide, where more than 200 customers enjoy working with our products. CIVIDEC benefits from its high level of experience and knowledge, as well as from an international network of research facilities and renowned scientists. By exploiting the intrinsic electronic properties of detector-grade CVD diamond, CIVIDEC has established a series of products, immaculately manufactured in Austrian hand-made quality, suitable for extreme environmental conditions. CIVIDEC offers versatile radiation diagnostic systems for neutrons, charged particles and X-rays. All our products are delivered with a product certificate. Each detector is calibrated with the respective particle source. We provide beam instrumentation for particle accelerators, diagnostic systems for nuclear science and beam position monitors for X-ray beam lines. Our products are available off-the-shelf and as customized solutions. CIVIDEC benefits strongly from the individual knowledge, experience and specialization of its team members. These factors enable us to provide an all-inclusive service from prototyping and product development to customer service. CIVIDEC highly specializes in innovative solutions for radiation diagnostics, based on CVD diamond detector technologies. This includes the detectors and also the related analogue and real-time digital electronics. CIVIDEC re-invests a substantial part of the annual turnover into research. This is how we manage to stay ahead in the field of radiation diagnostics and which allows us to pioneer diamond detector solutions for harsh environments. 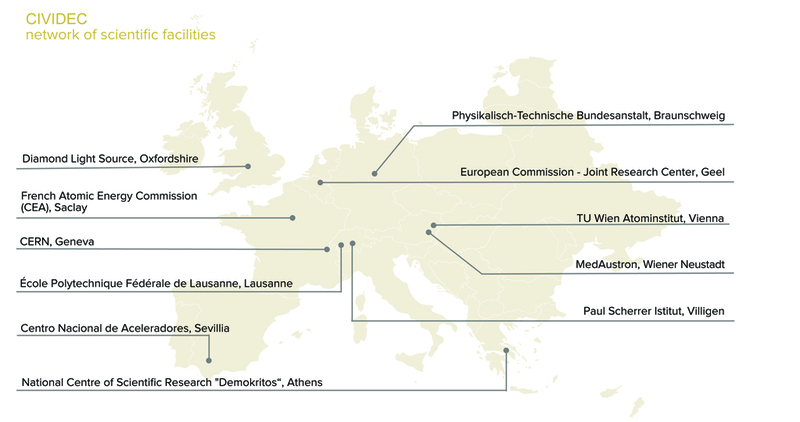 CIVIDEC is embedded in a network of international research institutions, which provides us access to dedicated facilities. The network enables us to cooperate with experts in related fields in order to test, improve and develop our products to turnkey solutions. CIVIDEC uses highest-grade materials for their products, which are manufactured by hand in the headquarter in Vienna. Each CIVIDEC product is tested, individually calibrated with the respective particles and delivered with a quality assurance certificate. We continuously provide trainings for junior researchers and support PhD studies, focusing on using the full capacity of CVD diamond detector technologies. CIVIDEC is part of numerous EC funded projects in the field of beam instrumentation and radiation diagnostics. - Our Diamond Beam Loss Monitors are a standard product at the CERN-LHC. They are used to measure LHC beam losses of 7 TeV protons in real-time with 1 ns time resolution and 25 ns bunch-by-bunch diagnostics. - Tests at the EC/JRC/IRMM [Geel, Belgium] proved the excellence of our Diamond Neutron Monitor: rates of 1 MHz, energy resolution <50 keV, real-time analysis with our ROSY® Readout System. - Tests at the Diamond Light Source [Oxford, UK] proved the excellent performance of our Diamond XBPM. For beams of 10 um diameter, a position resolution of ±2 nm was achieved. Publications resulting from our in-house research activities, including contributions by students which were sponsored by CIVIDEC, are listed below. Prof. Erich Griesmayer is CEO of CIVIDEC Instrumentation and has been working at CERN for more than 20 years. 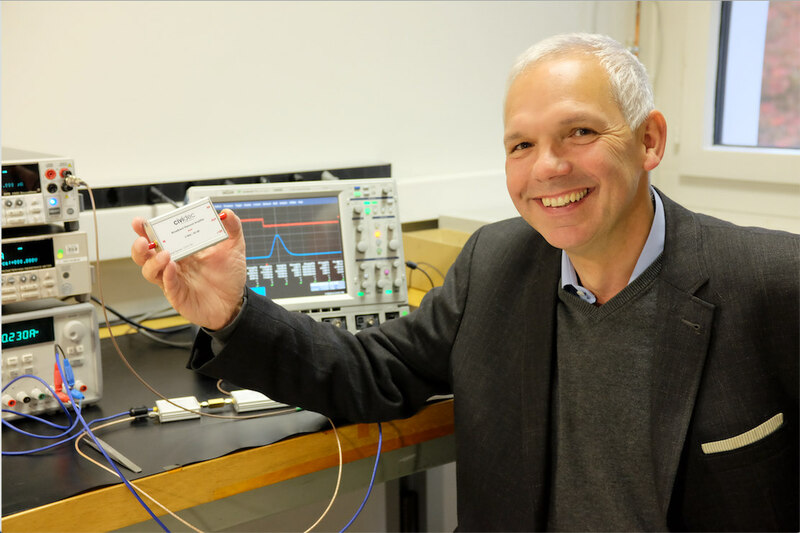 He is associated professor at the Vienna University of Technology in electronic instrumentation.